This week the City Council tackled the bread and butter of city government – streets, law enforcement, a retaining wall, and small community grants. But I’ve also found myself immersed in larger topics. Along with other U.S. mayors, I pledged our commitment to the Paris climate agreement. And Alexander Hamilton and James Comey have been on my mind. The Birmingham Drive Complete Streets project is moving forward, after the city allocated almost $600,000 to the project last week. Design and permitting will take almost a year, with construction slated for November 2018. The project involves undergrounding utility poles and lines, installing continuous sidewalks on both sides of Birmingham from the I-5 freeway west to San Elijo Avenue, and creating green spaces for bio-retension and storm water treatment, plus enhanced landscaping. The 1980s personalized sidewalk panels on the south side of the street will be preserved, although the details are not worked out yet. A roundabout is planned for the intersection with Newcastle Drive. These improvements will dramatically increase walkability and safety on the western side of Birmingham, which carries about 16,000 vehicles a day and hasn’t had any pavement rehabilitation since Encinitas incorporated 31 years ago. Birmingham’s pavement score of 34 out of 100 means the street is one of the worst in the city. The planned pavement overlay will use an asphalt concrete that contains recycled tire rubber, which will reduce the number of tires in local landfills. Open community meetings will be held to discuss the specifics. There is no current plan to improve the street on the east side of the freeway. Here’s the Encinitas Advocate story. The City Council on a 3-2 vote (Mark Muir and me opposed) approved installation of stop signs at the intersection of Vulcan Avenue and Union Street, adjacent to Paul Ecke Central Elementary School in Leucadia. I voted against this because I was persuaded by the testimony of Traffic Commissioner Peter Kohl, who showed us that 10,000 additional stops and starts will be made each day, backing up traffic on this major transportation corridor. I supported sending it back to the Traffic Commission for an evaluation of a different safety feature that would require cars to stop only when cross-traffic or a pedestrian were present. When stop signs go in, they never come out. I know there are more creative traffic controls than stop signs. Nonetheless, my perspective wasn’t shared by all, and the stop signs were approved. As a group, we disagreed without being disagreeable and amicably moved on to other city business. And with either choice, the bottom line is that kids and parents crossing Vulcan near the school will now be safer. Thanks to the ongoing generosity the Mizel Family Foundation, which gave the city a matching grant of $75,000, we were able to allocate $150,000 to almost 50 community groups, with most of them receiving between $2,500 and $4,000 each. I’m very grateful to the Mizel family for allowing us to double the support we offer to non-profits doing important work. Here are our city staff’s grant recommendations to the council, which we modified by adding additional monies to some of the recipients. 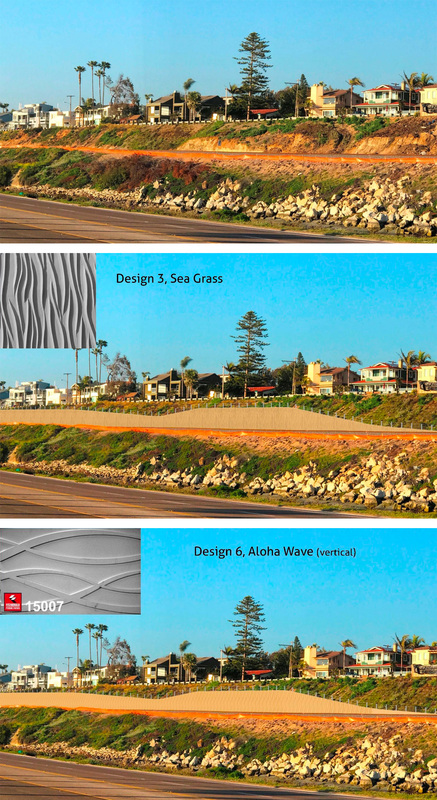 At top is the bank beneath San Elijo as it looks today, at center is the Sea Grass design which would cost $75k, and on the bottom is the likely choice, Aloha Wave, with the waves running vertically. You can click the photo to see a larger version. Recently the City Council tasked the city’s Arts Commission to hold public hearings and evaluate SANDAG’s proposed art designs for a large retaining wall that SANDAG is building as part of their double-tracking project through the San Elijo Lagoon. It wasn’t economically possible to make the wall a signature art piece, such as a dramatic colorful mosaic, so the options were limited to different concrete forms. The City Council affirmed the Arts Commission’s top two decorative choices – Seagrass and Aloha Wave. The Arts Commission recommended that the Aloha Wave pattern run vertically in order to minimize seams and avoid the choppy look that would occur because the wall is of varying heights. In reality, the two designs look very similar to each other, as you can see above. The city isn’t paying additional money for SANDAG’s retaining wall — which is required by that agency to stabilize the road and the homes above the railroad tracks. Given that the seagrass design would cost SANDAG an extra $75,000, it’s likely that the Arts Commission’s second choice, Aloha Wave, will be the final design that’s installed. The city approved the five-year agreement for our Sheriff’s contract. Encinitas is one of the nine cities out of 18 countywide that contract with the Sheriff’s department for law enforcement services, instead of having our own police department. A fairly recent study showed that Encinitas pays a smaller percentage of its general fund for Sheriff’s service than comparable cities pay to run their own police departments. For the next five years, our costs will go up every year, resulting in a payment that will go from $14 million yearly to $17 million by 2021/22. We’ll essentially be paying $3 million more with no change in the level of services and law enforcement personnel. This isn’t great, but rising costs, largely based on pension obligations, are a reality. Our contract includes 51.5 sworn officers, 3.5 community service officers, plus a captain, two lieutenants, and support staff. The industry recommendation is about 1 officer per 1,000 people and this is just about what we have. So basically we’re well-staffed with law enforcement, crime levels remain low, and while the cost is increasing, it’s still within a reasonable range. This week I joined at least 288 other American mayors in supporting the Paris Agreement. While our president may be withdrawing from the commitment we made with other nations in late 2015 to fight climate change, cities across America are re-committing to this essential environmental agenda. Our climate action plan, choice of energy provider, commitment to build the infrastructure needed for biking and walking, and re-energizing our investment in our tree canopy, are all important parts of Encinitas’ on-the-ground actions. More information on the mayors’ commitment can be found here. And finally, here you’ll find my recent Coast News column on affordable housing in Encinitas. 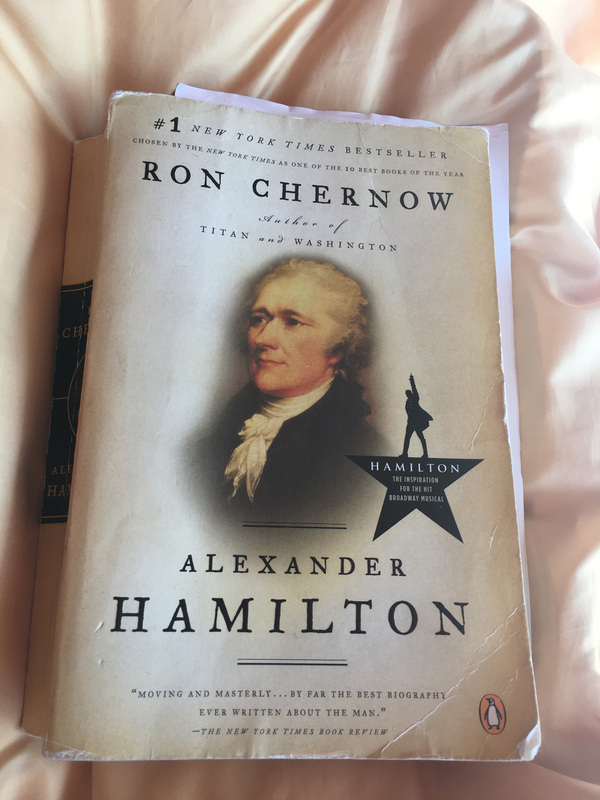 My dog-eared copy of the Hamilton biography. Watching part of the James Comey Senate hearings this week, I reflected on the founding fathers’ brilliance in having separated and de-centralized power among different branches of the federal government. The intricacy of our governmental structure, each branch depending on the other while remaining independent of each other to avoid risking the tyranny of either, struck me repeatedly as I watched the battle between executive and legislative. I was impressed by the caliber of the minds in our legislative branch as our elected senators questioned the equally impressive ex-FBI director Comey, formerly appointed in the executive branch. I believe Hamilton, as one of the main authors of the U.S. Constitution (and the Federalist Papers that explained the Constitution), would be proud and relieved that our system has endured the many challenges of the last 240 years. Together with a free and active press, our American democracy remains strong and vital today, in all of its messy glory. 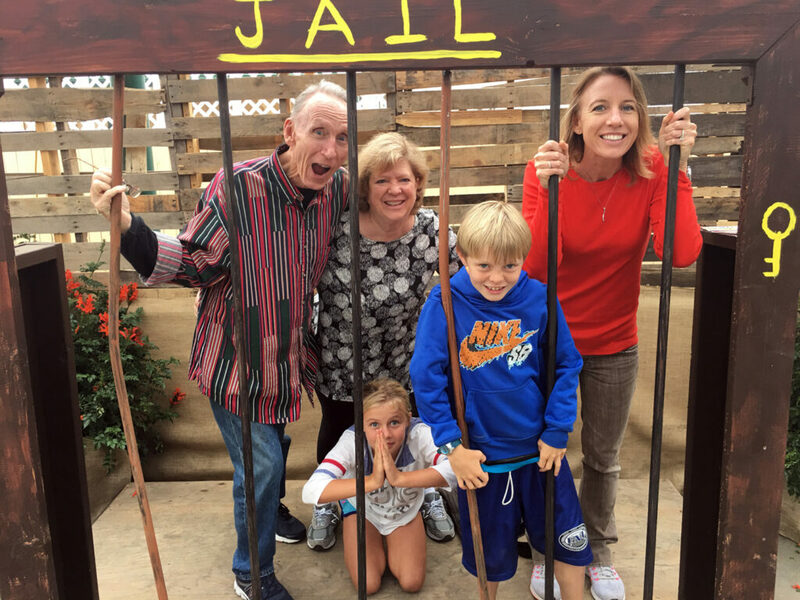 My dad John Blake and step-mom Michele Blake joined us at the Wild West-themed county fair in Del Mar last week until our luck ran out and we ended up in the hoosegow.